EBSiReceiving compliments Oracle E-Business Suite and helps business to speed up the Receiving Process. It provides ease to perform Receiving Transactions which facilitate Organizations to make Swift Decisions, Reduce Cost and Increase Productivity. 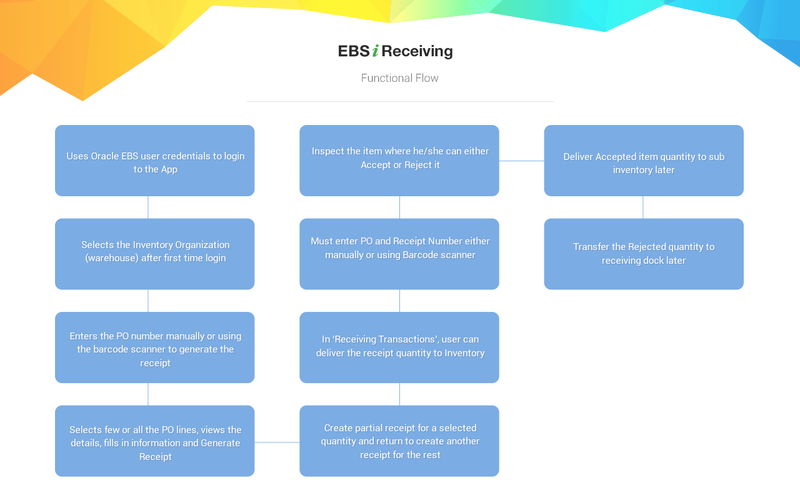 EBSiReceiving speeds up the process of adding Receipts on the fly along with other Receiving Transaction options, hence improving the overall process efficiency and productivity. This app supports Bluetooth barcode scanner to capture the required inputs and makes the transactions faster. The EBSiReceiving App provides users easiest way to accept the goods into Inventory. Using this App user can inspect the Inventory Items before delivering them to inventory. This app makes the Accept or Reject process faster using smart phones and hence improves business quality. The User can inspect the inventory real time and take the decisions faster on the move. This app is entirely integrated with Oracle Purchasing module and makes the receiving process of purchased goods into inventory easy with single click. This enterprise app makes the perfect use of mobile solutions to perform the receiving transactions on the move. Fully integrated with Oracle E-Business Suite. Requires and compliments Oracle E-Business Suite version 11i and R12. It supports Camera Scanner, Bluetooth scanner device as well as manual entering of data using your Smartphone. Supports Bluetooth scanner model CX2870-1409 from Socket Mobile. Provide End Users to enter receipts and receiving transactions from Smartphone devices on the fly. User can use the “Contact Us” option from the App to get the Sales Order and Delivery Names for demoing the App.